This past weekend I made the two hour trip down I-85 to visit my dad and family. The same two hour trip I used to make every single weekend when Brian and I were still long distance. As I was making the drive on Friday, and was inevitably stuck in miles upon miles of traffic, I got to thinking about long distance and how that used to be the "norm" for us. I can't remember making that trip and not being giddy even when sitting in an hour of traffic. It also made me think about what it took to make our long distance work. 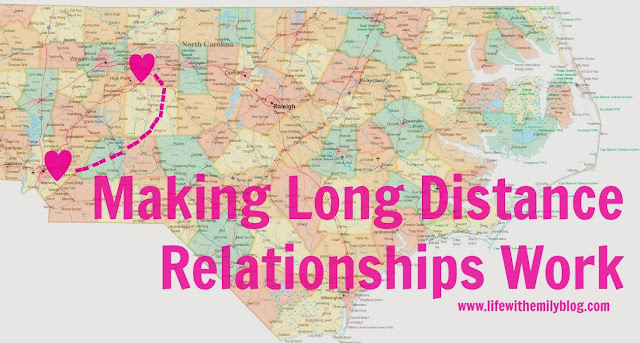 When Brian and I were still in a long distance relationship I received a lot of emails about how we made a LDR work, so I thought today I would do a *very belated* post about how we did it! Communication. This is one of the most important (and also most cliche) parts of making a long distance relationship work. While communicating is important, it's also important to not communicate too often...or there will be nothing to talk about. When we were in long distance we would send each other a few texts a day and then either talk on the phone at night or Skype. When you are communicating, talk about things that matter... your goals, morals, are you compatible about what matters most to you? Close or far away, now is the perfect time to figure these things out! Trust & Honesty. Of course, these are the foundation of any relationship, but they are particularly important when you are miles apart from each other. If you have already established trust, then it will make your relationship a lot easier. And always be honest. If something is bothering you...speak up about it! The other person may not know something is wrong unless you say so! Share Milestones & Moments. One of my biggest struggles with long distance was not being able to share exciting news face-to-face with one another. But, we couldn't leave each other out, so anytime something great would happen to either of us we would pick the phone up as soon as it happened and call each other. We both got to feel the excitement of each other and share the moment together. Continue To Live Your Life. It would be crazy to think the world didn't go on when the two of you weren't together. Continue to do things you enjoy, go out with friends, and live your life! Brian and I both still had our respective friends, cities, and activities. Just because we couldn't always be there together for it all didn't mean we couldn't enjoy it. Have Things You Only Do With Each Other. We kind of started this by accident, but it made our time together more special. There were a few places we would go and a few things we would do only when we were together. We didn't do it on purpose, it just kind of happened that way. So, when we were together we would go to our special places or watch the shows that we deemed "ours" and it made our time together a little more special! Try to have light at the end of the tunnel. I would by downright lying if I said being in a long distance relationship was exhausting and frustrating at times. But, having an end point and a light at the end of the LDR tunnel, was the best thing ever! Brian and I began our relationship from a distance. We only saw each other on weekends and holidays, so that was hard. I felt like there was so much we were missing out on as a couple, especially in the beginning stages of our relationship. What made it better was when we started talking about being in the same city, and making moves towards that goal. Once we had a goal and it worked out we lived by the "countdown." The countdown of how many days/weeks/months we had left until we were finally in the same city. It made it exciting and gave us both something to look forward to on our typical Sunday goodbye. So there you have it, a long distance relationship can work! Love this :). I'm in a long distance relationship right now, and I completely agree with everything you said - especially the "light at the end of the tunnel". My boyfriend (who lives in South Korea, we met when I was there for a month this summer) will be studying in America for a year just to be closer to me...and my ultimate goal is to move to South Korea back with him :). LDR's are hard, but completely do-able! I have been dating my Fiance for almost 7 years & the last 4 have been long distance! They totally work!! & communication is my number one advise to ANYONE going into long distance relationships!